When you’re reading computing articles it can get confusing trying to work out exactly what is meant when specific terms are used. We’ll break down the most commonly used ones so you can get a better grip on what people are talking about. 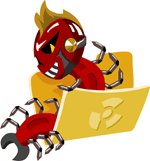 It can be useful to understand the various types of Malware so you can take action to avoid it affecting your system. This is a program or application that can replicate itself and tries to infect a computer without the permission or knowledge of the owner. It can often spread within a machine, infecting more and more files and can normally be passed from computer to computer via the Internet, by media (disc, usb drives) or by email. Normally a virus is attached to an executable file and starts to work once the file is opened. A virus will mostly perform some sort of destructive behavior like corrupting your files or hard drive, transmit personal details or send emails to your contact list. AntiVirus software is very effective in detecting and blocking viruses so you should make sure you have it installed and updated to avoid infection. This is similar to a virus in that it can make copies of itself but normally spreads across a network, can begin without any intervention from a person and does not need to attach itself to a file. Not all worms are designed to destroy files, some cause issues by blocking up network traffic to slow it down or install a back door in a computer so hackers can control the computer. Once a computer is under the control of a hacker it can be used to send spam or to perform other activities. One of the most important things you can do is to keep your operating system (Windows, Android etc) up to date as worms often use vulnerabilities in the operating system to access your computer. Also make sure you have a good Internet security program installed, perform regular scans and keep it up to date. Trojans generally disguise themselves as something else in order to trick you or your computer into giving it access to your machine. For instance they may come hidden in another program that you have downloaded, through a malicious link on a website or in the form of an email attachment that you click to open. 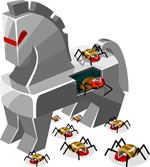 A Trojan is different to a worm or virus in that it does not duplicate itself. There are many reasons hackers use Trojan horses but one of the most common is to steal your information and data so they can commit fraud. The can also take control of your computer, view your webcam or cause damage. You can avoid Trojans by keeping your operating system and Internet browser up to date (Internet Explorer, FireFox, Google Chrome, Safari etc), scanning any downloads with your AntiVirus software before you open them and also making sure you only download programs and files from reputable sources. Creators of Ransomware generally infect a computer with a Trojan or worm that causes the user not to be able to use their computer without some sort of restriction. A ransom is then demanded in order to lift the restriction. It could be just certain files that are encrypted or it could be the entire system that is locked up. The most famous version was called CryptoLocker in 2013/2014 that demanded people pay up to $400 in Bitcoin to unlock the files on their computers. This is a program that is set to run on a computer and submits details of the computer use or the user to a 3rd party without consent. Spyware may monitor keystrokes (keystroke logging) to obtain passwords or other personal details. It often gets into a computer as a Trojan and can be bundled with other software. A computer can also be infected in a drive-by-download, for example clicking a malicious pop up window or link within an Internet browser. You can avoid spyware by visiting reputable websites (adult and download sites are often carriers of spyware), being careful what you click on and making sure you scan any files you install with a good antivirus program. When adverts for products originate from a program unknowingly installed on a computer it can be classified as adware. Normally the adware creators make money when adverts are clicked or when someone buys a product originating from the advert. Scareware is a type of Adware where a person is convinced that they need to buy something in order to avoid an outcome. A common form of scareware/ adware is for antivirus software. The computer user will start getting messages looking like system messages that their computer is infected and prompt them to download a fake antivirus program. Once installed the antivirus could contain Trojans or Spyware. Adware may also appear as an Internet browser toolbar that pushes adverts based on the websites visited or prompt users to visit other similar websites. A rootkit is a bit of software that attempts to hide worms, viruses, spyware and other types of malware by altering the computer system in some way.